Read more after the jump about Brian Tyler's entrance into the robot world! Soundtracks serve as the spiritual center of a film. Imagine John Williams' A New Hope or Raiders of the Lost Ark with a different soundtrack, and perhaps the film's emphasis is lost. Composers like Williams, John Barry (Goldfinger, Moonraker), Jerry Goldsmith (Star Trek: The Motion Picture) and Hans Zimmer (Gladiator, MI:II) have created some of film's greatest musical masterpieces, complementing what we see on the big screen and helping to complete the film experience. Television has seen its share of memorable music, albeit fewer and further between: Star Trek: TOS, The Equalizer, Airwolf, and NCIS are such examples. Gladly, you can now add one more to television's list: Transformers: Prime Season One. The album, composed by Brian Tyler (Fast and the Furious), and sporting 25 tracks, is one of the best television soundtracks in recent memory, sporting a big proud sound, reminiscent of Zimmer's Remote Control Studio cohort Steve Jablonsky's efforts with the Transformers trilogy. While Tyler's themes sport Jablonsky-like elements (pulsing strings and horns delivering the melodies), it's important to note that Tyler gets his sound from a real orchestra (namely the Slovak National Symphony Orchestra), which gives the sound a great organic feel. Jablonsky used all electronic resources to score his music. The CD's 75-minute runtime doesn't feel nearly that long, as it marches through its share of heavy action pieces and lighter moments. I know some have chided Tyler for his repeated use of the main theme in different keys and beats, but if Williams did it with Raiders and Star Wars, and Barry did it with Goldfinger, then there remains little reason why Tyler shouldn't. The theme is that good, that inspiring, and it certainly deserves a spot on your CD shelf or MP3 player. If there's one thing (and it's minor) that fails us is the case, which is fashioned out of cardboard rather than encased in the classic clear plastic. It's a minor thing, and should not deter you from picking it up. I'm glad that the distributor Lakeshore Records took the time to add some neat artwork to the inner case, such as nice images of Optimus Prime and Megatron as well as four-page artbook. While there's no liner notes here, the artwork improves the final product. The cartoon series, which has received terrific critical support, owes much to Tyler's epic soundtrack. And while Shout Factory's transfers of the cartoon series to Blu-ray have been less than stunning, one cannot make that claim with this product. 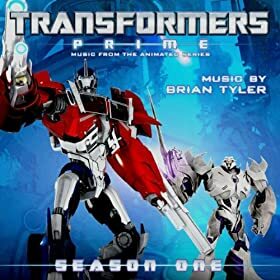 Transformers: Prime Season One Soundtrack takes its place among the best television efforts ever, with a pulsing sound that's big on production value. I rate it as one of the favorite in recent memory, and therefore highly recommend it.